The 2015 NASCAR Xfinity Champion Chris Buescher took a big risk, by leaving the Roush Fenway Racing organization for a shot at the ‘big show’ with a less funded team. However, this young wheelman has made the most of the opportunity and moved his #34 Loves Travel Stops Ford Fusion for Front Row Motorsports into the top-thirty of the point stands in a rain delayed ‘Bass Pro Shops NRA Night Race.’ Coupled with his win earlier this month at Pocono, Chris and the team sit twelfth on the Chase Grid. Buescher, who finished fifth yesterday at Bristol Motor Speedway, is now thirteen points ahead of thirty-first-ranked David Ragan. 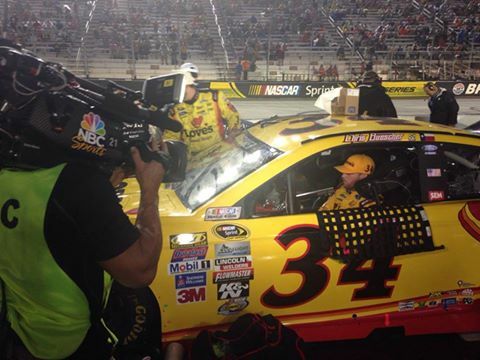 His teammate Landon Cassill sits twenty-ninth, just twenty-seven points ahead. Chris Buescher joined his cousin, James, as a NASCAR champion in 2015. James Buescher won the NASCAR Camping World Truck Series championship in 2013 while Chris countered with the NXS title last year.